Release Date: 2005 Running Time: 89 mins. On his American debut, director Henry Koster stood in the lobby waiting to see if the audience would laugh at his film. If they laughed, he knew he could make a career for himself; if they didn’t, he’d have to return to Europe, where he could be killed by the Nazis. Unwanted Cinema profiles Koster and other Jews who were involved in the movie business before and during WWII, as they struggled to preserve both their careers and their lives. In Koster’s case, the audience laughed uncontrollably. Others were not as lucky. “Ronald Reagan lived across the street,” Koster’s son, who grew up in Los Angeles, remembers. He describes his childhood as an old Hollywood fantasy, recounting fond memories of the Reagans, Gregory Peck, and others. “Brando taught me to play chess,” he adds nonchalantly. A documentary chock-full of information, Unwanted Cinema presents a collage of historical footage from pre-war Europe, clips from old films, archival celebrity home-videos, and personal stories told by the filmmakers’ children, to offer an inside look at the Jewish experience in Hollywood in the late 1930s. Until Hitler’s rise to power, Jewish actors and producers throughout Europe enjoyed critical acclaim and stardom. But once anti-Semitism began to spread, it threatened not only their celebrity but also their lives. Filmmakers and actors moved to Vienna and Budapest where their “unwanted cinema” was produced independently. Later, in hopes of escaping war-torn Europe, many Jews involved in cinema traveled to Hollywood to test their skills and their luck. 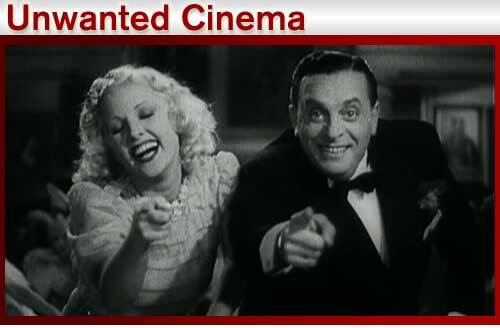 Unwanted Cinema offers a rare and candid glimpse into the lives of some of Hollywood’s early nobility. Home videos of big name producers, directors, and executives shows them drenched in golden sunlight as they lounge by their backyard swimming pools, tossing around giant inflatable balls, and suntanning. With wives in swimming caps and healthy children buzzing with exuberance, their lives seem to epitomize the contentment of the American dream. But adapting to Hollywood wasn’t a poolside holiday for every Jewish immigrant. For many actors their imperfect English was a major embarrassment and caused the demise of their careers. Ernst Verbest was a handsome, talented and nationally celebrated German-born actor. After his performances in Europe, the audience would carry him down the streets on their shoulders. But when he moved his family to Hollywood everything fell apart. He had friends in the industry, but he was unable to establish himself as an actor because of his difficulty with English. The poor man spent the rest of his career making pottery molds. His son remembers him beating the dining room table with his cane to vent his frustration. Nonetheless, Verbest could still be considered a lucky man. Other Jews in the film industry suffered far greater losses. Many never left Europe and died in the Holocaust, and even those who were fortunate enough to make it to America weren’t always able to stay. Some had to return to face great hardships in their homelands. The documentary points to both the cruelty and irony of anti-Semitism. Talent that was “unwanted” in Europe because of prejudice was celebrated on the other side of the ocean. The charming clips interspersed throughout the documentary prove the injustice of rejecting Jewish talent. 100 Men and a Girl, which was nominated for five Oscars, is just one example of the exceptional cinema for which these refugees were responsible. Ultimately, the documentary presents a strange juxtaposition. The harsh realities of the war and prejudice are examined in between old movie clips that are exceedingly lighthearted, almost goofy. Making no attempt towards realism, these old films depict romance as a ball gown waltz on a dock by a sailboat; and businessmen are cigar-puffing, grunting knuckleheads. Although this divide between reality and cinema is jolting, it makes perfect sense. At a time when the Holocaust was a looming threat, why wouldn’t a Jewish director want to create his own make believe world, full of innocence and naiveté?